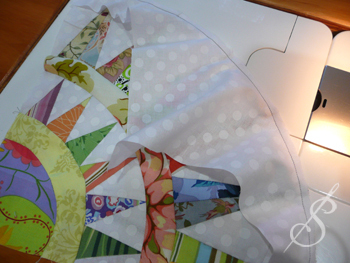 Paper Piecing and Curved Piecing. 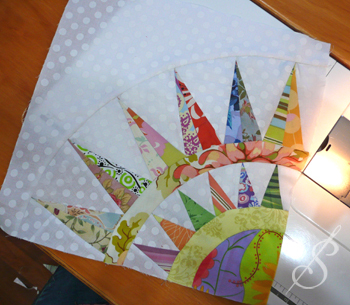 Tip 1: Standard binder paper (wide or college ruled) is an equivalent weight to paper piecing paper (15-16 lb). It feeds easily through home printers. And, best of all, it is very inexpensive! The down side: the blue lines. But, in most cases, they are too light in color to interfere with your design. 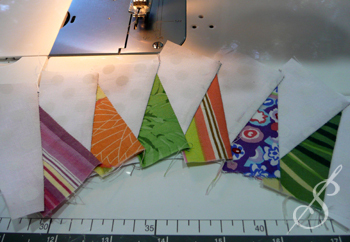 Tip 2: If you are truly a beginning paper piecer, I would recommend adding ¼” or more to all measurements. This will give you a little extra wiggle room as you learn the process. 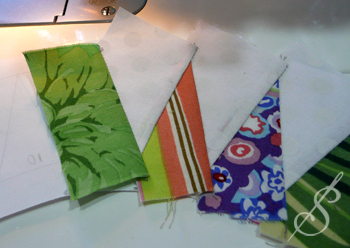 Tip 3: It is a good idea to use a pressing cloth or other protective sheet when you iron if you have made your own photocopies of the paper pieced templates. The ink/toner from home printed sheets tends to come off when it is ironed and can leave a mess on the ironing board. Tip 4: There are many different versions of the New York Beauty Block. This tutorial is specific to Block #4 of the Almond Country Beauty pattern. However, the basic techniques are the same for any Beauty block. 1. 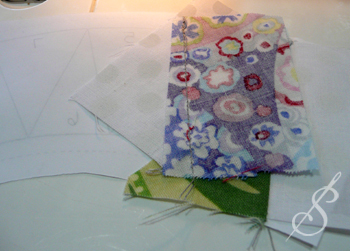 Calculating the fabric cuts. The first and last background pieces (#1 and #13 in this example) will be the same size. 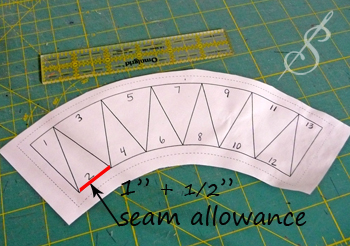 Measure the length of the seam line between piece 1 and 2, including the seam allowances on each end. This number will give you the length. 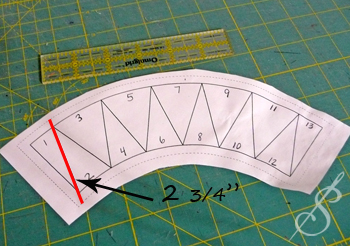 Measure the width of the widest point, including the seam allowance. 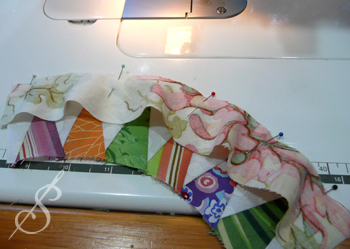 You will need to add in the second seam allowance, since only 1 is visible. So, you will cut: (2) 2 3/4" x 1 1/4" pieces. Background pieces 3, 5, 7, 9, and 11 are bigger, so they will also need to be calculated as well. In this example, there is not much size difference between #1 and #3, so the length will remain the same. However, it is important to note that is not the case with all Beauty blocks. To determine the width of the inner background pieces, you will need to measure the widest point and add a 1/2" seam allowance. So, you will cut: (5) 2 3/4" x 2" pieces. Use the same techniques to measure the points. 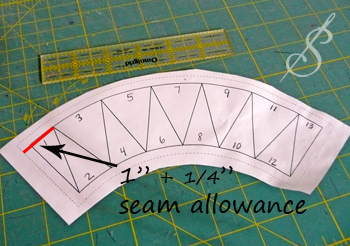 Remember to add 1/2" to the width for seam allowances. 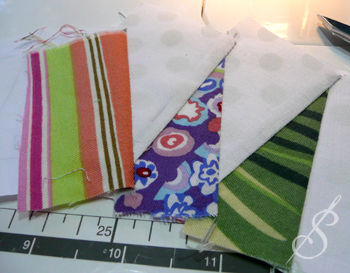 So, for the points you will cut: (6) 2 3/4" x 1 1/2"
Set your stitch length to 2. Position the first piece (2 3/4" x 1 1/4") over the area marked as #1. The fabric and the paper will be wrong sides together. It helps to hold them up to a light source so that you can check the positioning. Pin in place, if needed. The second piece will be added as shown. 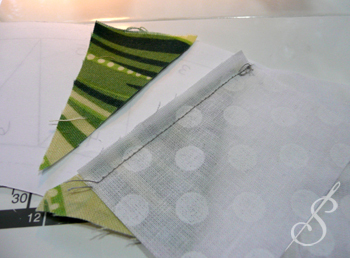 The fabrics are right sides together and the seam allowances have been aligned. 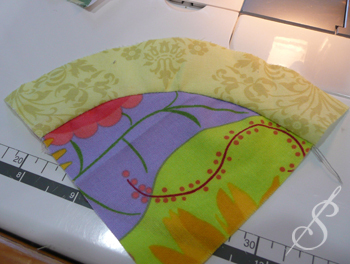 Flip the whole thing over and sew the first seam. This will be the line between spaces #1 and #2 and will include the seam allowances. Back spacing is not necessary. Flip the piece back over and open it up. Press. These pieces fill spaces #1 and #2. Position piece #3 so that it overlaps the line between #2 and #3 on the template by 1/4". 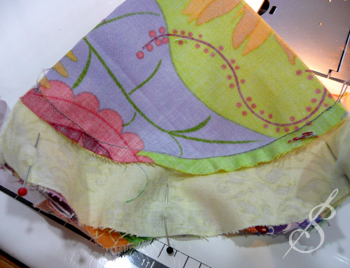 Flip the whole thing over and sew the second seam (the line between spaces #2 and #3, including the seam allowances). Flip the piece back over. 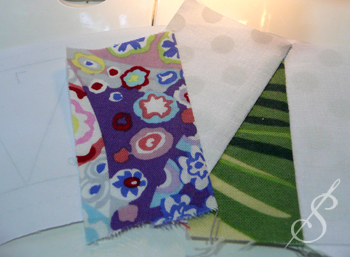 Note: If your background fabric is light in color, grade your seam allowance so that the lighter fabric is slightly wider than the darker fabric to prevent any shadowing. 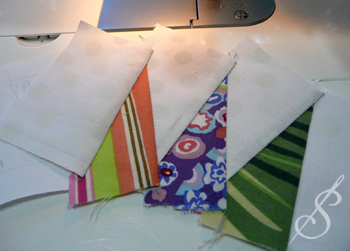 Fold the fabric back and press. Position piece #5. Flip. Sew. Flip. Trim. Press. Position piece #6. Flip. Sew. Flip. Trim. Press. Continue in this manner, until you have pieced the entire arc. To trim the arc, take it over to your cutting mat. 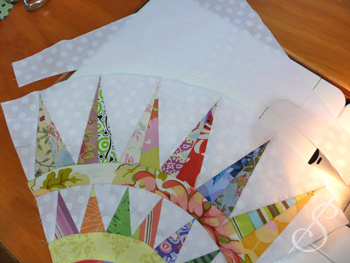 Place it paper side up and trim it on the dashed (cutting) line. This can be done with a rotary cutter and ruler, or with scissors. This specific block has 2 different rows of points, 2 different rings, a center and an outer arc. 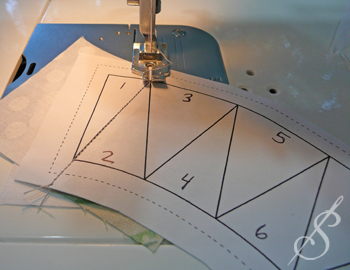 Not all Beauties have this many parts, but the basics of curved piecing are the same. 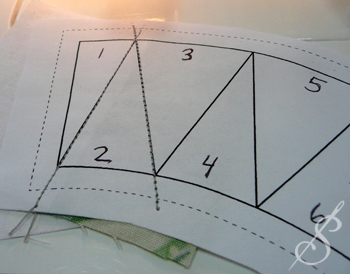 Use the templates provided with your pattern to cut the outer arc, the 2 rings and the center. These can be assembled in any order, so I am going to start by attaching a ring to the points we just made. Pin the ring to the wedge, right sides together. 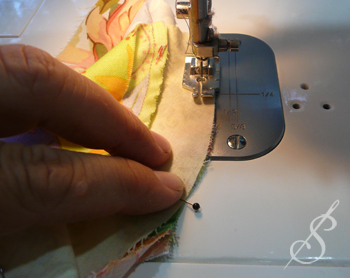 Start by pinning the mid point, add pins to hold each end, and pin in between those at least one time. This will help ensure the smoothest possible curve. 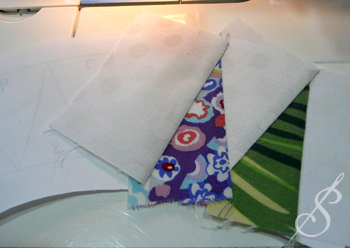 Sew these 2 pieces together with a 1/4" seam allowance. It works best to sew it with the larger piece on the top, so that you can keep an eye on the extra fabric, and avoid sewing in any tucks. Also, sew slowly. Repeat the same process to attach the smaller ring to the center. Attach the second wedge of points in place, using the same techniques. Give it one final press and you’re done!